Behold: the Clusterfuzz. A tweaker’s delight, the Clusterfuzz pedal is capable of delivering medium-gain overdrive up to raunchy square-wave fuzz tones. Unlike finicky vintage fuzz boxes (or their slavish modern clones with drifting bias and loose tolerances), the Clusterfuzz operates consistently and reliably by utilizing modern components and stable bias. In fact, it is not patterned after any existing classic or modern “boutique” fuzz pedal. It has its own flair and unique set of controls. The Clusterfuzz pedal delivers sounds that cut through the mix, with its multiple tone shaping and clipping options. Whether you are seeking a more refined fuzz or a “wall of guitar” sound, this beast of a dirtbox will satisfy those in need of a great fuzz sound with a lot of added tonal flexibility. 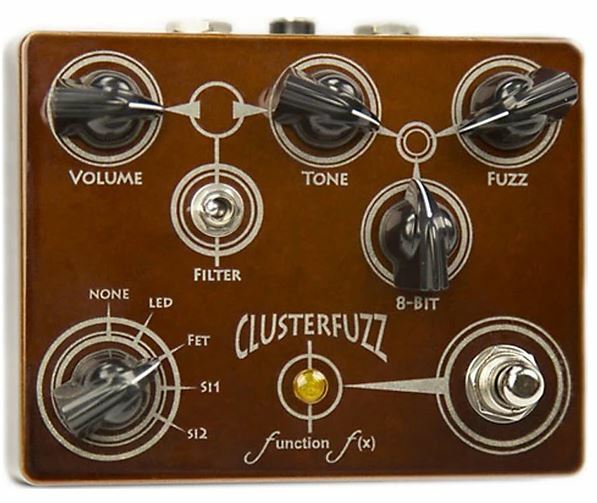 If you’re looking for the same basic tones but in a smaller footprint, check out the Clusterfuzz Jr.
Click here to download the Clusterfuzz pedal product manual.